A homeless support charity has helped a Lithuanian man who was sleeping rough in woodland outside Lincoln for six months return to his country of origin. The man in his early 40s had lost his home after becoming unemployed, and had created a temporary tent on the outskirts of the city, out of public view. He was only spotted when a member of public walking his dog in the woodland came across the tent and contacted the P3 Street Outreach Team. 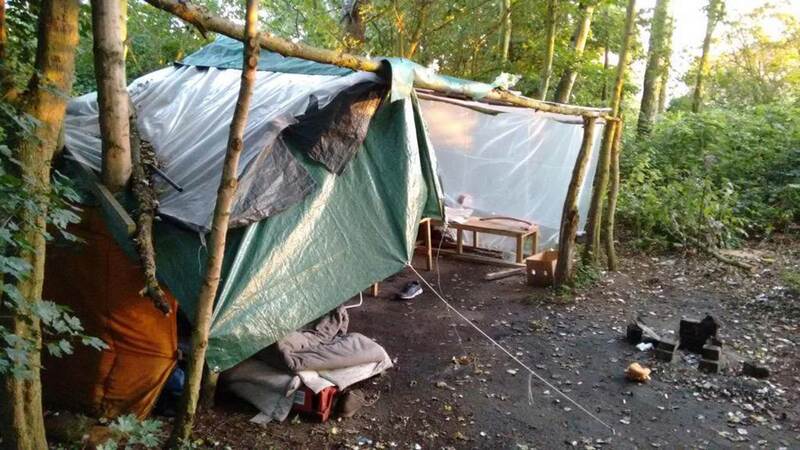 Jonny Goldsmith, service manager at the charity, posted the picture of the tent on Twitter on March 11, to highlight the issue of rural homelessness. He said: “We work with people who are sleeping on the streets of Lincolnshire and help them find accommodation as soon as possible. “The man had worked in the UK for quite some time and had his own accommodation. However, he lost his job, lost his house and found himself destitute. “He had created this tent from a tarpaulin over trees and had it developed it over time. He was relying on handouts and eating from bins. “At first, he was reluctant to accept our help as he was a very proud man. However, we were able to help him move back to Lithuania just before Christmas. “Rough sleeping is increasing nationally and doesn’t discriminate – we’ve helped UK nationals as young as 15 as well as people from Poland, Lithuania and Latvia.